This paper is part of the Council on Contemporary Families’ new Gender Revolution Rebound Symposium. Click to expand graphics throughout. For almost a decade now, researchers have been struck by a stall in what had been a remarkably rapid and seemingly unstoppable increase in support for gender equity and approval of women’s workforce participation up until the mid-1990s. This research paper provides evidence of what may be a rebound in support for gender equity since 2006. The General Social Survey contains four questions about gender roles that were first posed to the American public in 1977 and have been asked on every survey since 1985. While some of the questions may feel dated (remember they were first asked 37 years ago), they remain useful to show the degree of change in our attitudes about proper roles for men and women. And between 1977 and the mid-1990s, the rate and extent of change were nothing short of remarkable. In 1977, 66 percent of Americans agreed that “It is much better for everyone involved if the man is the achiever outside the home and the woman takes care of the home and family,” with just over a third of respondents disagreeing. By 1994, less than 20 years later, just over a third of respondents thought this was the ideal family arrangement, while 63 percent disagreed. In 1977, 68 percent of respondents believed that a preschool child was likely to suffer if her or his mother worked outside the home, with less than a third disagreeing. By 1994, almost 60 percent of Americans disagreed that maternal employment was harmful to preschoolers. In 1977, more than half of respondents (52 percent) believed that a working mother could not establish as warm a relationship with her children as a fulltime homemaker, but by 1994, only 31 percent of Americans still believed this. The percentage of Americans who believed that men and women are equally well suited to politics rose from just 48 percent in 1977 to 75 percent by 1993. 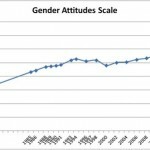 But in the late 1990s, the trend toward acceptance of new gender roles stalled and even dipped. The percentage of Americans disagreeing that a woman’s place was in the home slipped from 63 percent in 1994 to 58 percent in 2000. In the same six years, the number of Americans disagreeing that preschool children were harmed if their mothers worked fell from 57 to 51 percent and the number agreeing that a working mother could have an equally warm relationship with her child as a full-time homemaker fell from 69 to 60 percent. Between 1993 and 2004 the percentage of Americans saying that men and women were equally suited to politics fell from 75 to 69 percent. 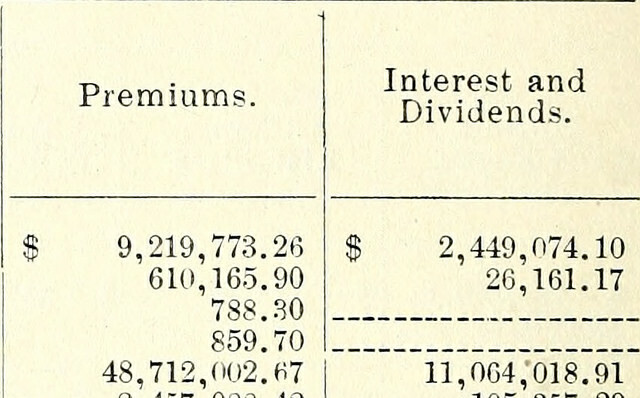 A number of explanations have been put forward for this “stalled revolution,” with some authors attributing it to the economic prosperity of the 1990s and some to the decline of the women’s movement, as organized campaigns for better work-family policies gave way to an emphasis on individual solutions, such as “opting out.” Other researchers pointed to a rise in cultural conservatism, while still others emphasized the emergence of intensive parenting, based on anxiety about children’s’ chances in an increasingly competitive world. Lately, there’s less concern about what gender makes the highest income and more about simply balancing the books. But our latest analysis shows that since hitting their low points, and especially since 2006, there has once more been upward progress in the values associated with approval of new gender roles and relationships. After slipping from 62 to 58 percent between 1994 and 2000, the percentage of people disagreeing that it is better for men to earn the money and women to tend the home rose to an all-time high of 68 percent in 2012. Less than a third of Americans now say that a male breadwinner family is the ideal arrangement. In 2000, only about half (51 percent) of Americans disagreed that preschool children suffer if their mother worked outside the home, but by 2012, 65 percent disagreed with this. 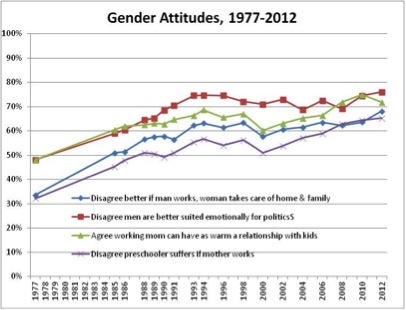 The percentage of respondents agreeing that a working mother can establish as warm a relationship with her children had dropped to 60 percent by 2000 (the same it had been in 1985) but by 2012 it was back up to 72 percent. (This was the only attitude question that has showed any slippage in the last few years, as it had reached a high of 75 percent in 2010). 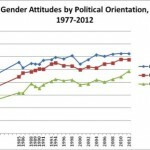 And the percentage of respondents saying that men and women are equally suited to politics had rebounded to 76 percent by 2012. The chart below (left) summarizes the long-term upward trend, along with the fluctuations, in the four questions that measure acceptance and approval of new gender roles. In the next chart (below right), we simplify and clarify the patterns by creating a simple scale of these four items, where if an individual responded in a gender egalitarian manner she or he received one point, resulting in a scale ranging from 0 to 4. This summary measure illustrates the larger picture — nearly forty years of progress towards egalitarian attitudes with a puzzling pause between the peak in 1994 and the present. In 1977, the typical American endorsed 1.5 of these questions in an egalitarian direction, and by 1994 that had risen to 2.6. Endorsement then hovered at about that same level, even falling a little, until 2008, after which it reached nearly three (2.8) out of the four questions. What Lies Behind these Changes? The following charts help us explore whether these changes in public attitudes reflect demographic or political changes in the population. One possibility might be a growing gender gap on these attitudes: that men and women have been changing their views at different rates. 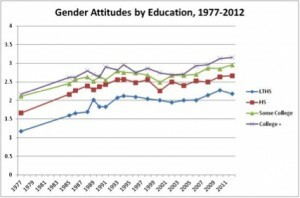 But a comparison of trends for each gender does not support this (Fig. 3 below left). 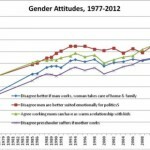 On average, women are slightly more egalitarian than men, but the difference has remained fairly consistent over times. 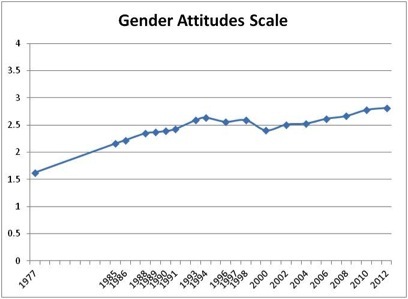 The general pattern over time has been the same for both men and women – early movement toward egalitarian attitudes, a stall in the second half of the 1990s, and then a resumption of egalitarian trends. A second possibility is that these trends are explained by changes in political affiliation or ideology over the period. Perhaps the stall in the mid-1990s represented a swing back toward conservatism in those years, and the restart in the 2000s a resurgence of liberalism. Although people who describe themselves as “liberal” tend to be more egalitarian and those who are “conservative” are more traditionalist in gender attitudes, the differences between them have not changed much during the entire time period. Furthermore, the same pattern of stalling and restarting can be seen for each group (Fig. 4 below center). If anything, the long-term trend has been toward a narrowing rather than a growing gulf between liberals and conservatives on these questions. 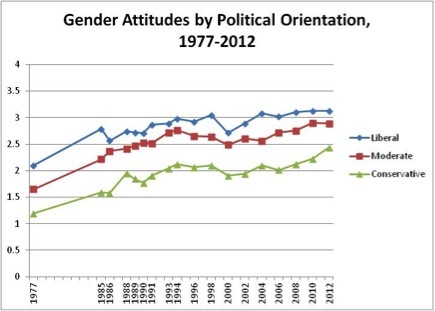 In fact, during the “restart” of the gender revolution in the 2000s the greatest increase in the extent of egalitarian views has occurred among conservatives. The higher people’s level of education, the more egalitarian their answers (Fig. 5 below right). On average, in both 1977 and 2012, people with a bachelor’s degree or more scored one point higher than those with less than a high school degree, and one half-point higher than high school graduates. The half-point gap between high school and college graduates in 1977 narrowed for most of the period but since 2000 has opened back up to a half-point difference. The trend over time for education follows the same familiar pattern – early progress, stalling, and restarting in all educational groups. 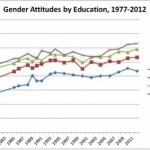 Finally, we look at generational differences in gender attitudes (Fig. 6 below). Each subsequent generation has a more egalitarian orientation than the ones before it, although the gaps progressively decline for the newer generations. The same pattern of upward motion, stall in the 1990s, and then a restart is seen in the Silent Generation (born 1925-45), the Baby Boomers (1946-64), and the GenXers (1965-1980). But even after the restart, the scores for these generations never exceed their mid-1990s peaks. The restart is real for all these groups, and egalitarian views may continue to rise in all or most, but at this point the main force pulling the overall average up beyond its earlier high point is the entry of the Millennial generation, which displays the most gender egalitarian attitudes of all. At this point, it is unclear why the progressive pattern may have resumed. The timing of the major events that might spur period changes – 9/11, the Great Recession, etc., is wrong. But the fact that the restart takes place within generations at approximately the same time suggests that something may have happened – we just don’t yet know what. Cotter, David A., Joan M. Hermsen, and Reeve D. Vanneman. 2004. Gender Inequality at Work. A volume in the series, The American People: Census 2000. 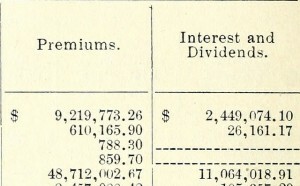 Russell Sage Foundation and Population Reference Bureau: New York. Cotter, David A., Joan M. Hermsen, and Reeve D. Vanneman. 2011. 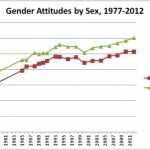 “End of the Gender Revolution? 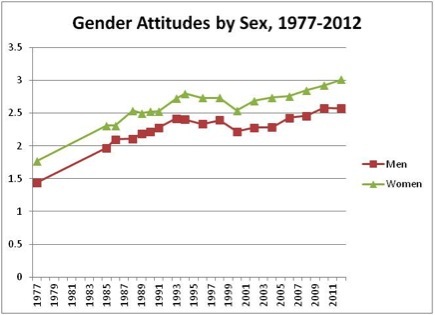 Gender Role Attitudes from 1977 to 2008,” American Journal of Sociology 117:259-289. David A. Cotter is in the sociology department at Union College. He studies stratification and inequality. Joan M. Hermsen teaches sociology and women’s and gender studies at the University of Missouri. She studies inequality, labor markets, gender, and quantitative methods. Reeve Vanneman is in the sociology department at the University of Maryland. He studies gender inequality.